A 3-D printed “upper,” the top part of a shoe, at Voxel8 in Somerville. Inventors and entrepreneurs from Massachusetts revolutionized shoe production — over and over again in the 18th, 19th, and early 20th centuries. They developed the tools and systems that transformed it from a labor-intensive craft to an industry that cranked out millions of shoes a year in vast factories. 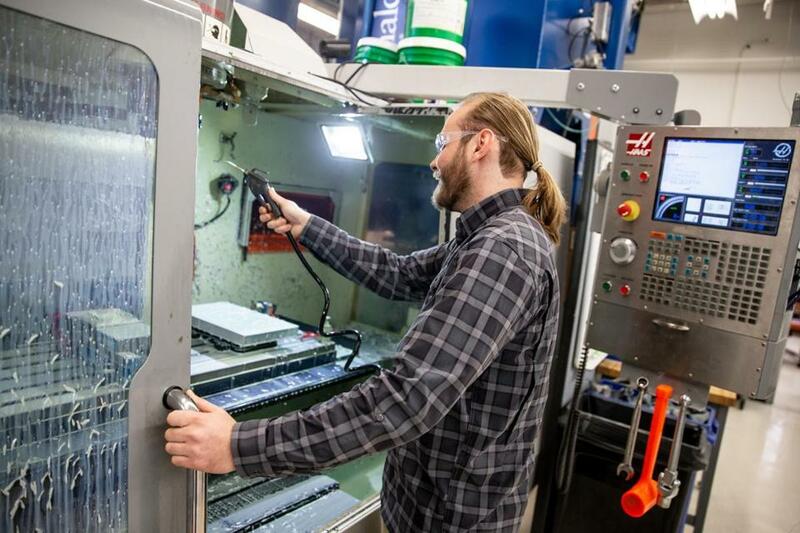 A small Somerville company, Voxel8, hopes to revolutionize shoe production again, by selling a new kind of 3-D printer to manufacturers that will help them offer almost infinite customization, and avoid making too many extra shoes that don’t get sold. Broadly speaking, 3-D printers build durable objects from digital designs, using a range of materials from powders to polymers to metals. The one that Voxel8 has built can use several different kinds of materials at once, which would let it apply different colors and consistencies of materials — some stretchy, others firm — onto fabric. “The way shoes are made has to change,” says Travis Busbee, the company’s cofounder, CEO, and chief technology officer. “Companies like Nike and Adidas will have 800 different lines of shoes on their sites, each with three to five color patterns, and 21 sizes. They have to start designing each model of shoe a year and a half in advance of when they hit stores, and bet on that model being popular.” If a particular design isn’t a hit, then “they have to discount those to get rid of the inventory,” he adds. Busbee says the use of 3-D printing technologies will reduce overproduction, and accelerate the design-to-shelf journey. Application engineer Alex Koukhtieva printed shoe designs at Voxel8 in Somerville. While other 3-D printing companies have concentrated on making soles, Voxel8 is focused on the top part of the shoe, known as the upper. Busbee explains, “It’s more complex in terms of the number of parts, and the labor intensity,” or the amount of work involved in making it. The Voxel8 technology will be able to take a raw piece of textile and print high-resolution, full color imagery, as well as those rubbery grommets that hold the laces, and other structures to give the shoe stiffness. 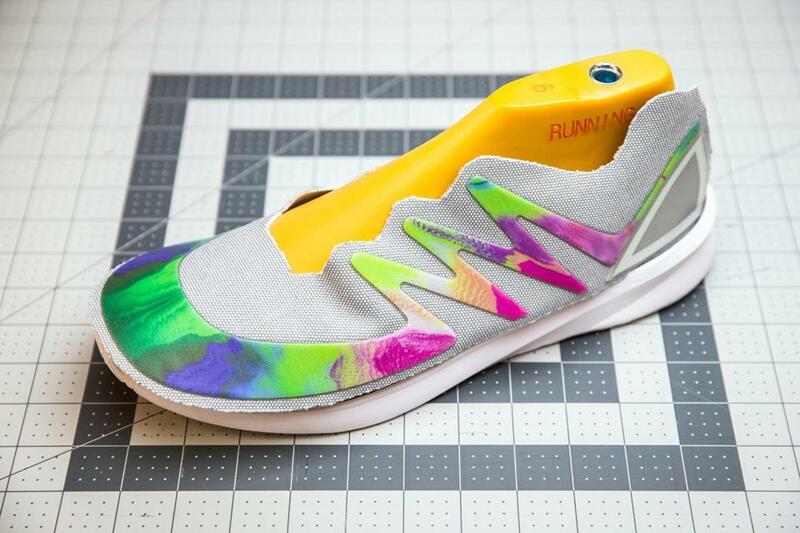 It’s a bold pronouncement for a company that was founded just four years ago, has 12 employees, and originally launched a printer to crank out not sneaker components, but objects with integrated circuitry. Voxel8 introduced what it called the “world’s first 3-D electronics printer” at the 2015 Consumer Electronics Show. It could do cool things like integrate an antenna right into the housing of a cellphone. Busbee says the company sold about 100 of those printers, which were priced at roughly $13,000. But big electronics companies like Apple and Samsung didn’t exactly fall all over themselves to start using the printer as part of their manufacturing process. A few shoe companies, however, were more interested. As Voxel8 shifted from building an electronics printer to focusing on the needs of the shoe industry, it laid off employees, and a previous CEO who ran the company for just a year, Phil Inagaki, handed things over to Busbee. Before joining Voxel8, Busbee, 28, had been a PhD student in the Harvard lab that originally developed the 3-D printing technology; this is his first experience working for — or running — a startup. The company raised $12 million in funding in 2015, but Busbee says it will need more — a task he hopes to complete in the next few months. Voxel8 is also on the verge of landing its first big contract with a footwear company, he says. The key decision: should Voxel8 sign an exclusive deal with one of the biggest players, or work out several nonexclusive supply arrangements with smaller brands? 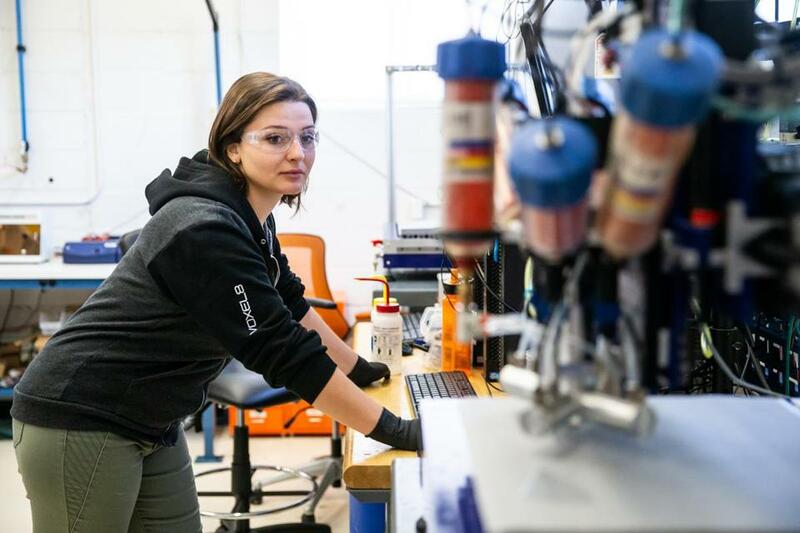 Beyond footwear, Busbee believes there are other applications for the company’s printer, like sports bras, compression clothing, or braces — “anywhere you need reinforcement on textiles,” he says. Engineer Nicholas Holmes used compressed air to clean a milling center at Voxel8 in Somerville.